Everyone Wants to Know What’s Beyond the Fence? The crowd is abuzz with excitement as we board the comfortable, climate-controlled bus. Like kids on a roller coaster slowly approaching the apex of a hill, everyone watches out of the vehicle’s huge windows with anticipation. The bus rolls forward a few hundred feet and pauses at the closed and secured gates; the entrance to Deer Haven Park on Rte. 96A in Romulus. My fellow passengers and I – participants in the area’s newest ecotourism and military history tour – can’t wait to see what’s behind the fence of the former Seneca Army Depot. After 20 years of petitioning legislative officials and appealing to the public, the tour is a dream-become-reality for Seneca White Deer Inc. (SWD), a small not-for-profit group of conservation-driven folks. Their ongoing journey began in 1998 with Waterloo native and visionary Arthur Hall, then president of the Seneca County Federation of Sportsmen. He foresaw that the closure of the World War II-era depot would direly affect the survival of the white, whitetail deer that lived within the 10,000-acre military installation. It is the only known herd in the world. The rumored tale that the white deer are a product of a disastrous overspill of some military concoction is just that – a tale. They are a product of their own recessive gene passed down through the herd much like that of a recessive human gene for blue eyes or red hair. It is all a matter of genetics. The condition, called leucism, occurs because the hair follicle lacks pigmentation, aborting it of color. Art pulled together five wildlife biologists and conservationists, the team appealed for the conservation of the land and preservation of the deer. On that bandwagon of core activists was Dennis Money, who succeeded Art as president in 2003. Fast forward to 2016 when the Seneca County Industrial Development Agency, the temporary overseer of the relinquished depot property, granted a winning private bid for the sale of 7,000 acres to local businessman Earl Martin. Martin, owner of Seneca Iron Works in Seneca Falls, developed a plan to conserve 3,000 acres of the land to historic military preservation, ecotourism, and the conservation of all wildlife within. Next, Martin partnered with SWD to lease the use of the preserved acreage, dubbed Deer Haven Park. The partnership enabled SWD, via the continued tax-deductible contributions of good-hearted folks everywhere, to share this amazing gift with the public. 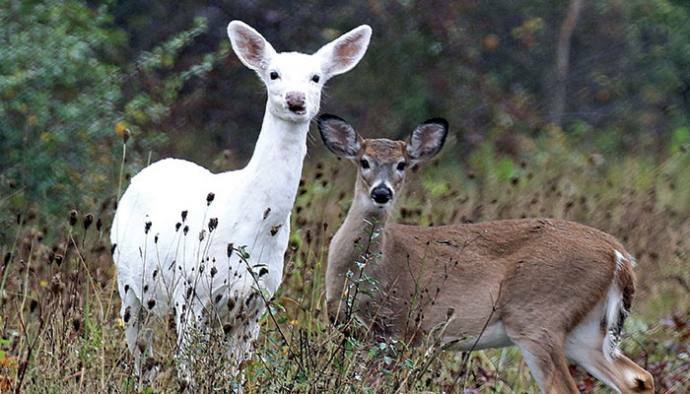 The goal is to make the white deer tours a world-class ecotourism attraction. The John and Josephine Ingle Welcome Center at the park’s entrance opened its doors in November 2017. Its namesakes own Heron Hill Winery. Without the Ingles’ significant financial contribution – from the sales of designated “Save the White Deer” labeled wine, and matching, dollar for dollar, world-wide contributions – the $255,000-plus center would not have materialized. The combination museum, gift shop and tour base is open to the public year-round. There are also munitions igloos, 519 of them, which were constructed in just four months by hundreds of triple-shift workers. Storage here provided munitions to our Armed Forces overseas, everything from bullets to 10,000-pound bombs! A walk through one of the immense storage units emphasizes the intensity of the consistent construction done so long ago and in such short order, and brings home the strength and patriotism of the laborers involved. Fields rolled by. Once active detonation sites are now void of use, but still seem to emanate a lingering energy. Pictures flashed in my mind’s eye of a once-active military presence triggering unstable matter. Grenade practice areas and shooting ranges used by reservists also make an appearance. Homeowners reported feeling the blast vibrations up to 35 miles away, a thought that lingers as we disembark and wander through an actual personnel bomb shelter once used by soldiers who worked nearby. We glimpsed the infamous “Q Area” through triple-thick, barbed-wire-topped fencing. Its middle row once surged with more than 4,000 volts! The Q Area contained “special weapons” – many of which are rumoredto have been nuclear bombs or their components. The government, however, has never confirmed such suspicions. We noted the motion detectors and bulletproof lighting at the perimeter of the site. In this “no-lone zone,” military police once maintained two-person-at-all-times security. The use of deadly force was allowed. It leaves an ominous chill in the air and sends another one up my spine. Just north of this site, the Women’s Encampment overflowed with activists against nuclear arms, whose presence was well documented as demonstrations unfolded in the summer of 1983. Travelling onward, the guide discussed life as it once was here in 1941. It was not all about the military presence. I learned that dispossessed families whose farms once stood on this acreage were given mere days to leave. Seeing the remnants of their homestead and barn foundations, mere relics of what they once were, left me with a feeling of empathetic realism. As the guide shared military history and information about the wildlife there, tour participants were asked to give a shout-out if they saw anything of interest so all of us could partake and capture photos. Suddenly, the request was interrupted by an audible gasp. Someone cried out, “Deer!” and all heads turned to discover a regal white buck surveying its onlookers. Its gaze seemed to penetrate into the depths of my soul as our eyes met and shared unspoken thoughts. Everyone noticed another movement as a brown doe tentatively stepped out of the brush not far behind, her demeanor more intent on foraging than on her audience. A couple cameras snapped; shutters anxious to freeze a moment in time. The deer, startled, rushed off into the trees with white tail flags waving – a warning to other deer nearby, we were told. Every onlooker hovered in a mutual space of awe until the bus eased forward. We all hoped that the journey ahead might reveal more glimpses of the surreal creatures. An osprey nest appeared ahead, a massive hodgepodge of sticks looming against the skyline. Another, an eagle’s nest, looking large enough to comfortably hold a human, has been the home of one pair for more than a decade. They are the proud parents of two eaglets born just this year. Newly erected birdhouses dapple the grounds. They were created and placed by local Boy Scouts, their supporters, and by the residents of neighboring Hillside Children’s Center. Also abundant are food plots and fruit and nut trees, which all provide welcomed sustenance to the deer. The land dates back to the Iroquois, and to the Revolutionary and Civil Wars, so the history is vast. The tour guide talked about World War II, the Women Ordinance Workers (WOWs) and the Italian prisoners of war, the part that the Lehigh Valley Railroad played, and why the military originally chose this site. The stories are as endless as the passing landscape, an archaic wonder transporting visitors back through time. When all is said and done, the time spent here left me longing for more – not only for more wildlife, white deer encounters, and military history, but also for the serenity of the land – so absorbing, relaxing, complete. A gift. A reprieve. A unique Finger Lakes adventure, found nowhere else in the world, and one worth taking. WHAT: Year-round guided 90-minute bus ecotours of the former Seneca Army Depot to see the only known herd of white, whitetail deer in the world, while visiting abandoned sites and indulging in a vast military history. COST: $30 adults, $27 military and seniors (65+), $15 children (5-15yrs), children under 5 free, specialized group tours are also available. Inquire about private, bike or hiking options. WEBSITE: senecawhitedeer.org, and/or like SWD on Facebook. Previous articleCalling All Adults, Ballet is for You too!